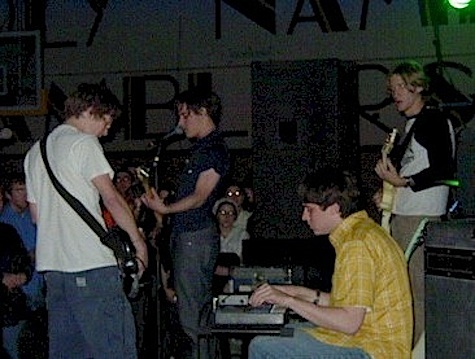 Desaparecidos rock the Holy Name Fieldhouse in April 2001. First, Desparecidos is playing tonight at The Waiting Room and believe it or not, there’s still tickets available as of noon today. If you have any interest in going, you should go to the this e-tix page right now and buy your $25 tickets. Next, you should read my interview with Desaparecidos’ Denver Dalley where the guitar-playing blond wonderboy testifies that the current incarnation of Desa ain’t no reunion gig, it’s the real deal. The boys are back for good this time, and that means new music and (maybe) a new album. The story was written for The Reader, which means you’ll have to go here to The Reader website to read it. Just click this link. DO IT NOW. Okay, if you don’t want to do it now, you can wait until tomorrow when the story appears in the printed version of The Reader. Yes, I know this should have come out last week, but there was a snafu with the deadline and, well, JUST GO AHEAD AND READ IT NOW. And then go to tonight’s show, which should be a freakin’ blast. The So-So Glos are opening. Show starts at 9.